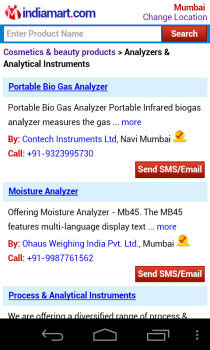 Online B2B marketplace IndiaMart has launched its mobile site m.indiamart.com and an Android app which available for download from the Google Play Store. It appears that the Android app is just a wrapper for its mobile site. We have reviewed the Android app. One of the first thing we noticed while using the app is that it’s utilizes entire screen of the device, hiding the notification bar. Besides this, as discussed earlier since the app is a wrapper for its mobile website, the design is not exactly optimized for an Android app. In fact, the app just looks ugly and it’s difficult to navigate through categories for people with fatter finger. The app home tab displays all the categories of products that the site offers and also has a search bar on the top and bottom of the page that remains consistent across all pages. 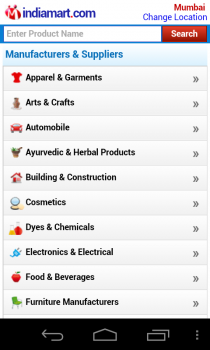 One can either search for products from the search bar or browse through categories. The app also allows one to set their location. However, the usability of this feature is not clear, as we found that even after setting the location to Mumbai, the app gave us results from the search query and through category filtration from all locations across India and not just from Mumbai. 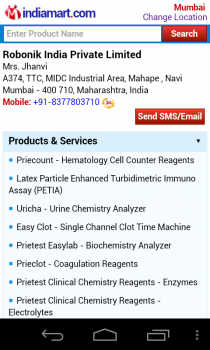 The listing page for suppliers and products displays description of the product, supplier, location of the supplier, and their contact number. One can make a call directly by clicking on the contact number, however, since the app uses phone’s contact app to make a call, carrier charges apply. 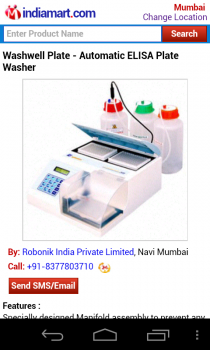 It also offers to send an email or SMS to the supplier. It looks like Indiamart is handling the SMS delivery themselves, since the SMS didn’t go through our carrier. On the product page, the app displays information such as product image, features, technical descriptions, among others depending on the category of product one has selected. One can also browse through all the products offered by a particular supplier. Note that the app only allows buyers to browse through suppliers & products and does not allow one to post a buying requirement or go through available tenders. The company claims that it currently has 1.2 million suppliers and 6.5 million buyers on its platform, which essentially means that the mobile site is targeted towards the 6.5 million buyers.